Anna R. Johnson, MPH, Melisa D. Granoff, BA, Miguel G. Bravo, MD, Bernard T. Lee, MD MBA MPH FACS. Background: Hispanics are the second largest demographic that underwent cosmetic surgery in 2017. The popularity of cosmetic surgeries amongst this group has increased significantly within the past decade, and is projected to continue rising. Patient-directed websites that provide educational materials addressing these procedures should include information that is at a minimum accurate, but also fully understandable and sensitive to the diverse cultural and ethnic needs of the target demographic. Online patient-directed health resources have been shown to vary significantly in their quality and reliability. This can be inimical for patients, as misinformation has been shown to lead to poor health outcomes. 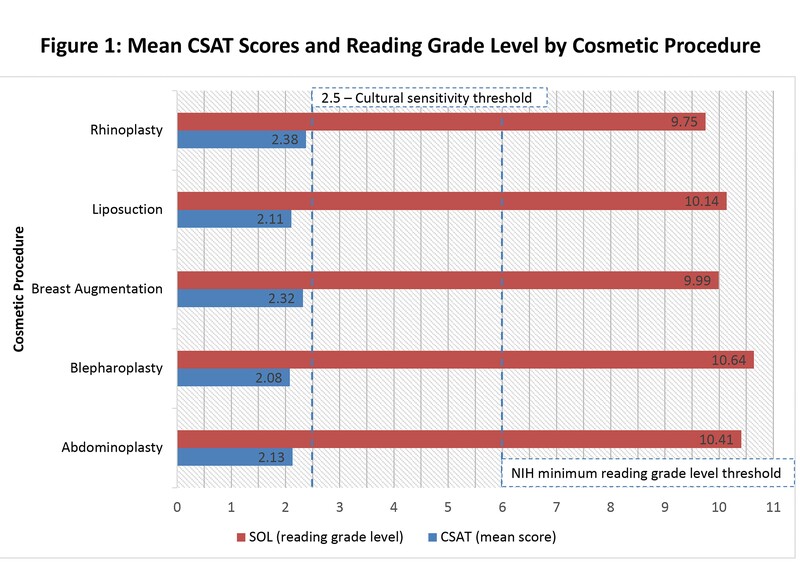 In this study, we aimed to evaluate online Spanish patient-directed materials provide by academic institutions, organizations, and private practice groups for the top five cosmetic surgeries performed in 2017 using validated metrics. Methods: The top five cosmetic surgeries performed in 2017 according to the American Society of Plastic Surgery were identified. The following google search terms were used: “breast augmentation”, “liposuction”, “rhinoplasty”, “blepharoplasty”, and “abdominoplasty”. The top 10 websites providing relevant information in Spanish were identified for each procedure. Fifty unique web links were analyzed by two independent bilingual raters using the Cultural Sensitivity Assessment Tool (CSAT), and mean reading grade level was determined using the SOL (Spanish equivalent of the Simplified Measure of Gobbledygook) in Readability Studio. Inter-rater reliability was computed using Cohen's kappa (k). Results: Online information in Spanish was difficult to encounter, with an average of 130 websites evaluated to identify 10 websites for each surgery. Mean reading grade level of all evaluated pages was 10.19, appropriate for a high school sophomore. There were no statistically significant differences between cosmetic surgery procedures (p=0.69). Mean cultural sensitivity score was 2.20 (2.08-2.38). No subgroup met the threshold score for acceptable cultural sensitivity (>2.5). Cohen's kappa was 0.72, consistent with substantial agreement between raters. Conclusion: This study demonstrates that US websites do not offer appropriate Spanish materials for users seeking information regarding cosmetic surgeries. Websites providing information in Spanish were often automatic translations, which were frequently inaccurate and further compromised reader understanding. In our search, we frequently encountered organizational statements expressing a commitment to diversity. However, in light of the poor cultural sensitivity of Spanish materials evaluated, we will outline tools to aid providers and organizations in improving materials for Spanish speakers. Increased awareness and development of more appropriate materials is paramount in order to effectively communicate with patients.